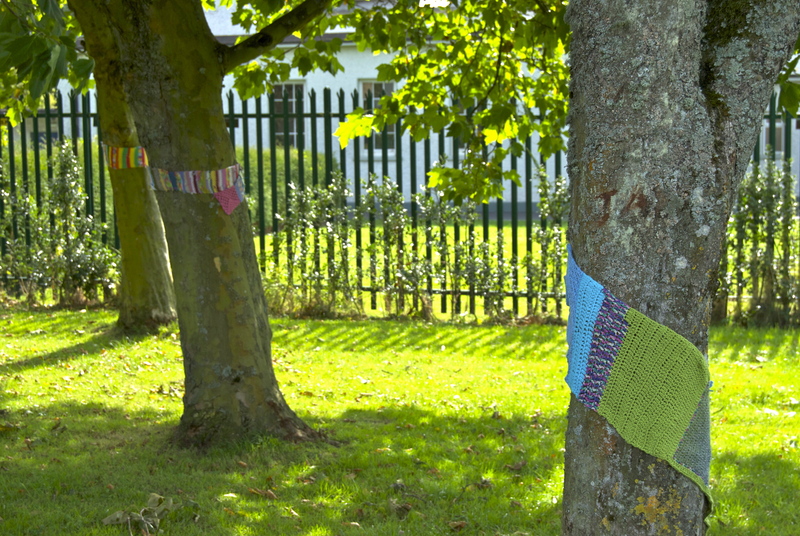 During the recent yarn-bombing event for Culture Night in Mullingar, a number of people were intrigued by the idea of covering public buildings, sculptures and trees in colourful knitwear. 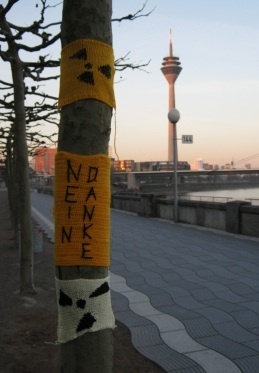 As some had never heard the term yarn-bombing before, I’m focusing this blog post on the origin of this art-form also called yarn-graffiti or ‘guerrilla knitting’. The start of the yarn-bombing movement has been attributed to Magda Sayeg from Houston, Texas, who, back in 2005 and on a whim, knitted a cover for the doorknob of her shop. She was pleasantly surprised, if not slightly taken aback by the response she got from amused customers and passers-by. So it spurred her on to do more. Madga, a self-taught knitter also known as PolyCotN, founded the “Knitta Please” group as a way to deal with unfinished knitted projects. The group started to reclaim and personalize public spaces by wrapping lampposts, telephone poles, benches and signage with knitted or crocheted material. These yarn installations were decorative, fun and non-permanent art pieces. In 2006, Bergère de Fance, the manufacturer of French yarns invited the group to Paris to celebrate their 60th anniversary, and on the occasion Notre Dame de Paris among many other buildings were tagged in a colourful way. From its modest origins, yarn-bombing or yarn graffiti began to be practised throughout the world and a renewed interest in knitting and crocheting emerged especially among young people. Knitting and crocheting groups began to run their own art projects and create wonderful and intricate installations, some with a political twist. The Knit Knot Tree by the Jafagirls in Yellow Springs, Ohio gained international attention in 2008 while Londoner Lauren O’Farrell came up with the concept of street stitched stories and founded the collective ‘Knit the City’. Its four active members are Deadly Knitshade, The Fastener, Shorn-a-the Dead and Lady Loop. The aim of this group of knitters is to guerrilla-knit London and beyond and bring the art of stitching to a world without wool. 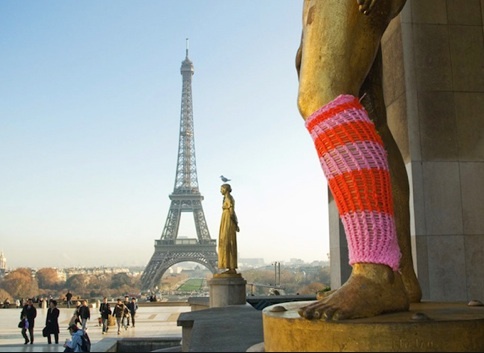 While yarnbombing is about passionate knitters and crocheters coming together to create fun public installations incognito and making people smile, it can also be a political medium through which to send a strong message to the community and the world at large. For that reason, it is recognized as being part of the wider craftivism movement. 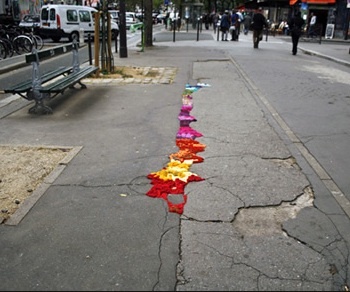 As a form of street art yarn-bombing is relatively new: the colourful coverings that liven up and personalize, dull impersonal urban spaces or it may be done to make a political statement usually in a humorous, gentle, peaceful manner. Yarn-bombers are principally women and therefore some feel that there is a feminist element in this art/craft movement. Guerilla knitting is quite a marginalized art form as is any type of street graffiti: it is ephemeral, outdoors and often done anonymously. It is now quite widespread a means of expression that spans across the generations and across the globe. 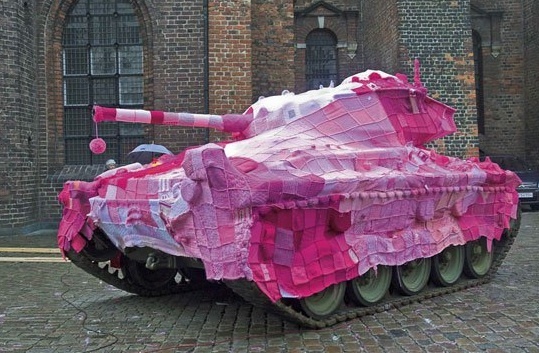 In May 2006, in Copenhagen’s main square, a WWII tank was covered with more than 4,000 pink squares, woven together from the handiwork of hundreds of knitters as a symbolic act of protest against Denmark’s involvement in the Iraq war. PS: Note that International Yarn-bombing Day is on 7th June 2014! Be ready!